The lateral hypothalamus integrates critical physiological functions such as the sleep-wake cycle, energy expenditure, and sexual behaviors. These functions are severely dysregulated during mania. In this study, we successfully induced manic-like behavioral phenotypes in adult, male Wistar rats through bilateral lateral hypothalamic area kindling (LHK). To test the validity of the model, we studied the effect of standard antimanic medications lithium (47.5 mg/kg) or valproic acid (200 mg/kg) twice/day for 15 days in attenuating manic-like behaviors in the LHK rat. Compared with pre-kindling behaviors, LHK rats displayed significantly increased sexual self-stimulation (P = 0.034), excessive rearing (P = 0.0005), feeding (P = 0.013), and grooming (P = 0.007) during the kindling interval. LHK rats also drank more alcohol during the mania-induction days compared with baseline ethanol consumption levels (P = 0.01). Moreover, LHK rat exhibited increased total locomotor activity (P = 0.02) with reduced rest interval (P < 0.001) during the mania induction and post-mania days compared with baseline activity levels and rest intervals. Chronic administration of lithium or valproic acid significantly attenuated manic-like behaviors in the LHK rat model. 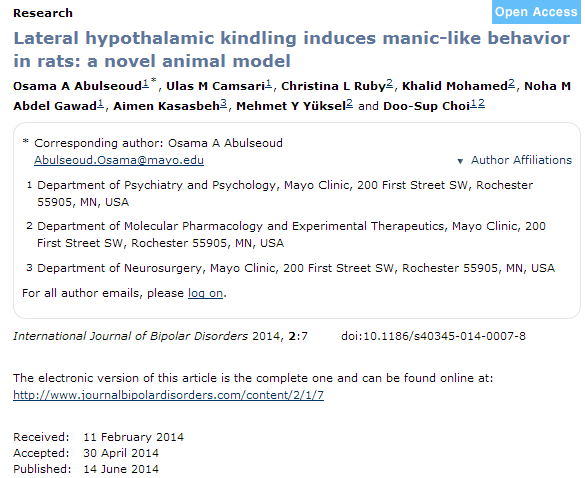 Given the behavioral phenotype and the response to standard antimanic medications, the LHK rats may provide a model for studying manic psychopathology in humans.